The most iconic bridge in the world. I have a thing about bridges. Even the rather ugly concrete Itchen Bridge that I cross everyday has a place in my heart. It's not just about scale for me, although I do love a big bridge, it's about looks and having had the chance to drive over and stand in awe of the Sydney Harbour Bridge, for me it's the most beautiful and iconic in the world. The thing about it is how it dominates the skyline of Sydney. Take a trip out to the suburbs, Vaucluse in the East for example, and look back at the City Centre, the bridge dominates your view. Of course there are other famous landmarks but your eyes are drawn back to the bridge and the glorious arch that crosses the harbour. 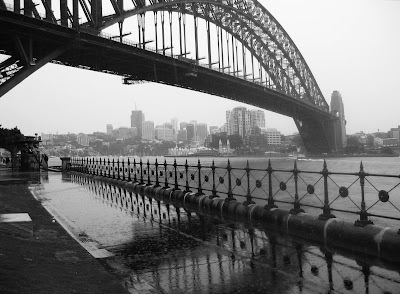 It's been nearly 20 years since I spent 10 months in Australia and for a long time after coming home it was images of the bridge that would take me back there. It was the first thing I saw when we arrived, the plane wing dipped to the right as we approached the city and I looked out of a window and caught a glimpse of the bridge and Opera House and I think as we left there was a conscious feeling that saying goodbye to the bridge meant saying goodbye to the City. Having grown up on the Isle of Wight there wasn't much of an opportunity to build up an attachment to a bridge like there would be growing up in places like Newcastle, London, Glasgow or even Hull. I needed to live somewhere for a while where there was one to appreciate how they could get under your skin. Having lived in London for 8 years I fell for other bridges, but none have ever touched me in the way Sydney's did, I love it because it was my first. The setting, naturally helps. Sydney is a beautiful City and the harbour is truly stunning, blue and green everywhere and sunshine, so much sunshine. It's a modern City, bustling busy and cosmopolitan but at its heart is something designed and built in the early part of the 20th Century, almost Victorian looking, that strides across its harbour like something from another time. Other cities have beautiful bridges but often cities with water that needs to be crossed will have multiple bridges and Sydney doesn't, at least not close by and in plain view. London has many many bridges competing for your attention, it's hard to just fall for one of them. I get that tonight's post is a personal one, and yes I have chosen my favourite, but no other bridge has had that kind of an impact on me. Forgive the indulgence. Tonight's post is dedicated to @3Stars_Left, @FY3R_OPTIC, @Nicky_T, @Comedyfish, @jaxsensei and @surprisedzoe who didn't partake today but shared Sydney with me all those years ago. You couldn't climb it when we went there. When I went back I stayed in a hotel right under the bridge.